Ben is nervous about staying alone with his Aunt Rose while his parents are away. When she welcomes a large dog named Gully into the house for the weekend, he becomes even more worried. He doesn't want to admit to Hana, a girl his age who lives near Aunt Rose, that he is afraid of dogs, especially since Hana thinks Gully is so great, but he's also not sure he'll be able to survive sharing his living space with a dog even for just a couple of days. In this novel, celebrated Canadian author Jean Little demonstrates a strong sense of empathy for quiet kids with big fears. Little creates a three-dimensional and believable child in Ben, and she describes his anxiety about interacting with dogs - and about taking chances in general - with great compassion. Many kids are afraid of dogs, and this book does a nice job of first validating their fears before attempting to dispel them. Ben comes to appreciate Gully on his own terms, not just because others say he must, but out of his own determination and gumption, and the result is a very satisfying story. The message - that we all have different dragons to overcome - is a perfect and necessary lesson for upper elementary school readers. This book was first published in 1987, but it holds up quite well. There is very little reference to cultural or technological phenomena of the 80s, so it doesn't feel like an old book, and the subject matter is so universal, that it will never really stop being relevant. It has been republished as recently as 2007 (thought with an unfortunate cover sure to turn off kids who are apprehensive about dogs! ), and though it is currently out of print, used copies seem plentiful online. 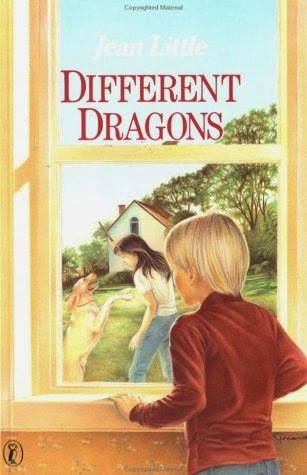 Different Dragons is similar in tone and style to books by Kevin Henkes, such as Junonia and The Year of Billy Miller. It may also appeal to kids who enjoy other "boys with fears" stories like the Alvin Ho and Justin Case series.